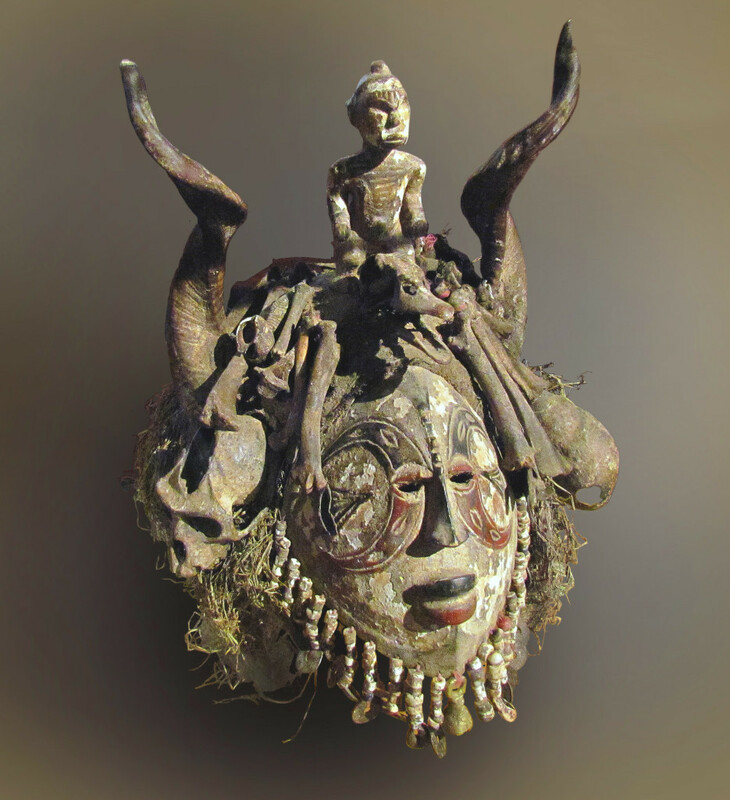 Mask from the Igbo people, Nigeria. Double minkisi. The ventral “mirror” enables the nganga (priest) to detect the presence of witches. 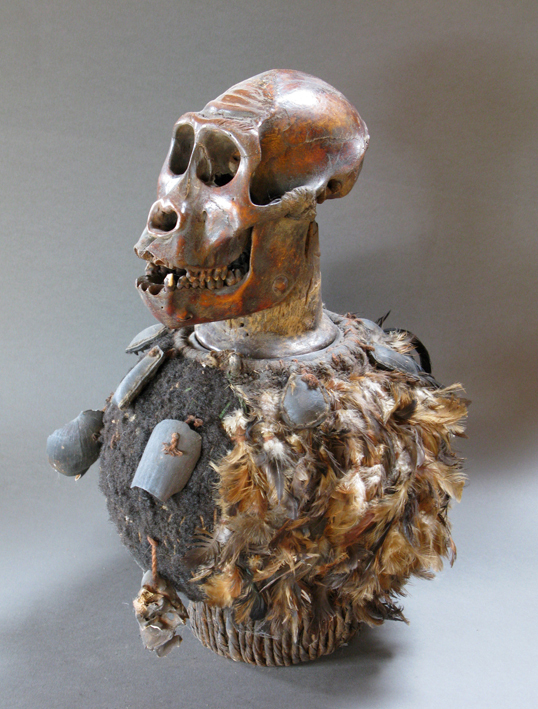 Palm wine calabash topped with a moulded baboon skull. Bulu, Cameroon. Secret society calabash topped with a nkisi stopper. 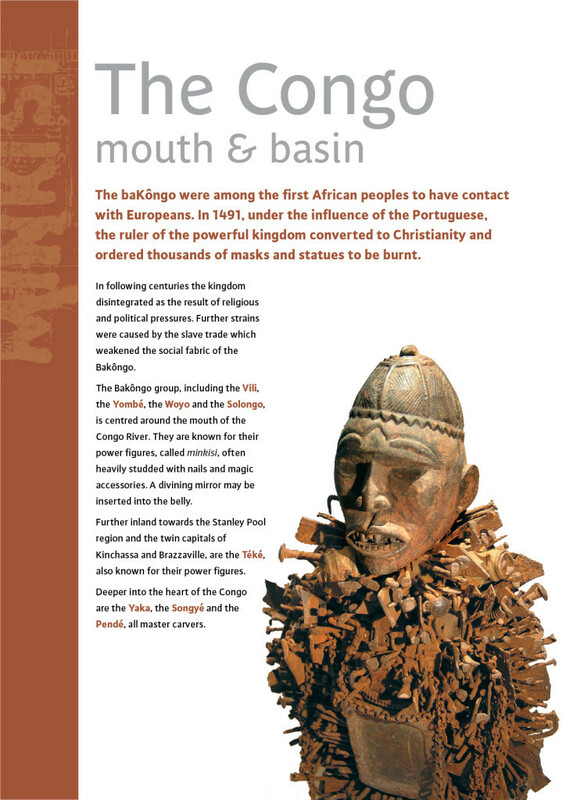 Bakongo peoples, Rep. of Congo. 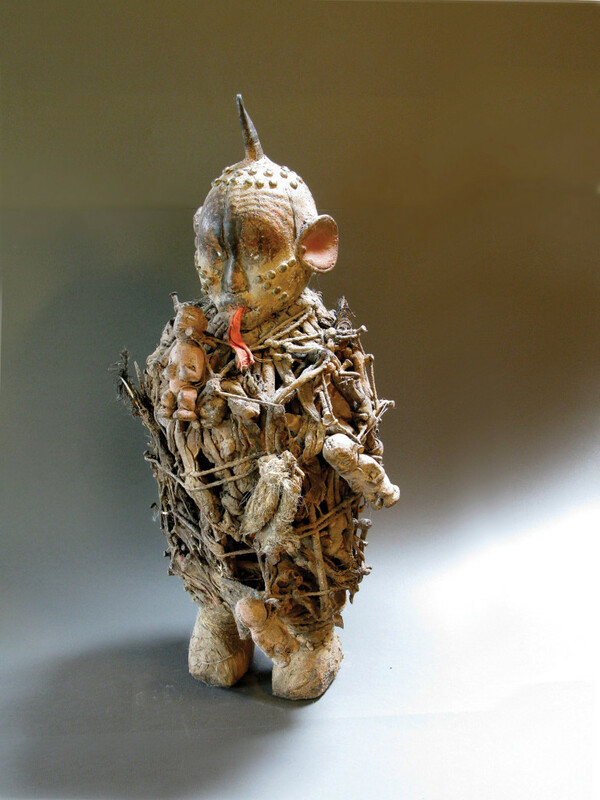 Heavily charged nkisi-nkonde figure, empowered by small attached minkisi. 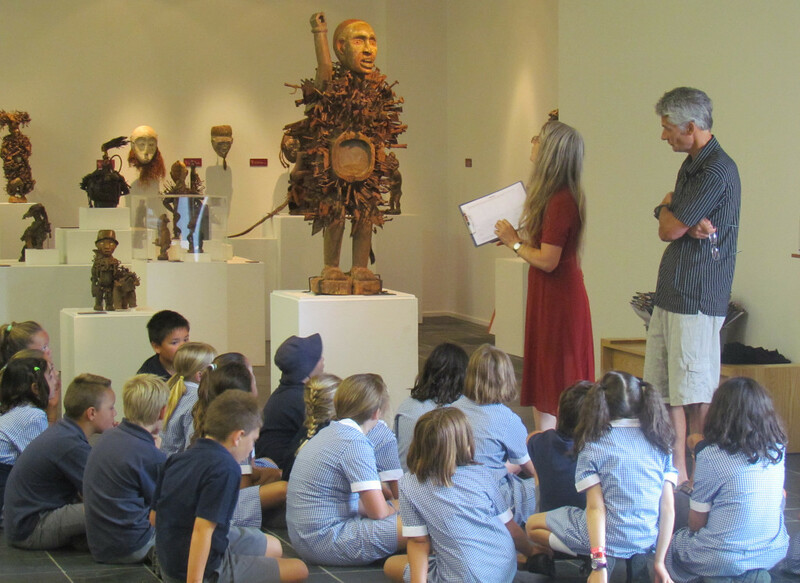 Educator Ester McNaughton in action, Suter Art Gallery, Nelson. Paul Le Lay (right) in his country home in Tonnère, France. 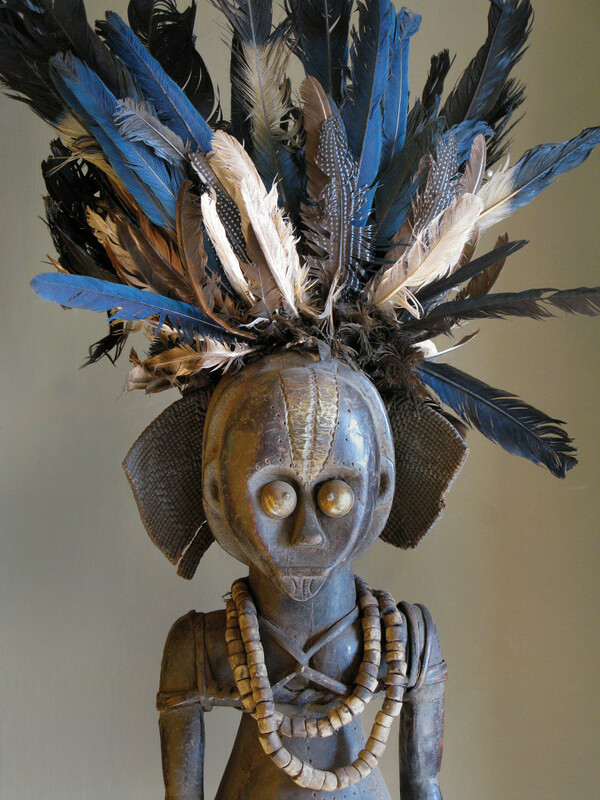 The seventy-five statues and masks that compose this exhibition challenge our ideas about art, belief, tradition, and culture. 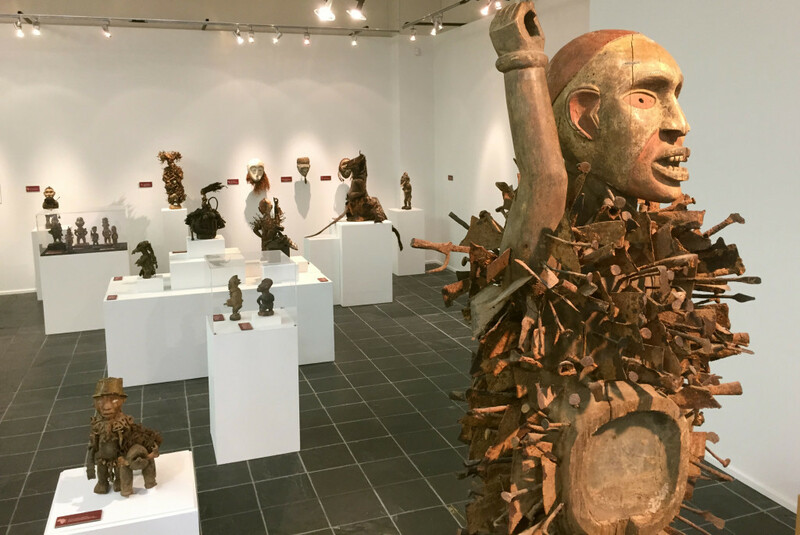 The works are from ethnic groups in nine countries ranging from Ivory Coast to the Democratic Republic of the Congo, with the emphasis on minkisi power figures from the lower Congo. These statues, bristling with nails and laden with magical charms, have given the exhibition its name and much of its impact. Anthropomorphic or zoomorphic, sometimes as big as a man, they project authority and power. How should we look at these objects? Whether we know it or not, we all have cultural codes that affect our way of looking. When we contemplate an object from a culture foreign to our own, we sometimes have to make a conscious effort to understand the visual language of the artist who made it. To do this we need insight into the artist’s life, society and beliefs. 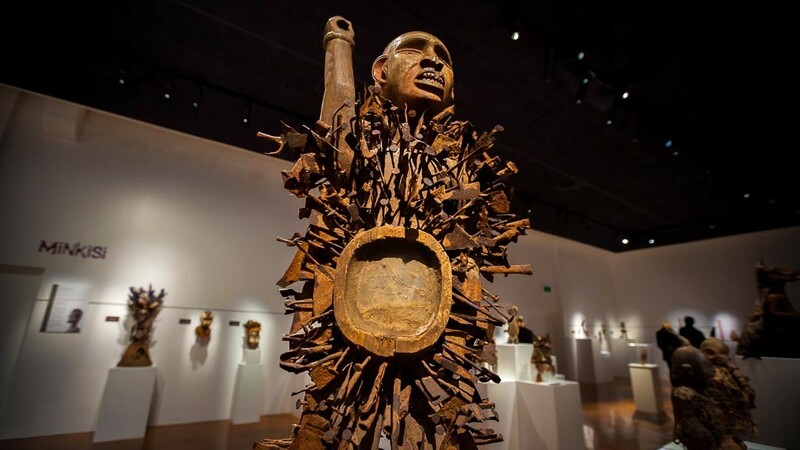 An example of cultural misinterpretation is our sense that nails hammered into a statue represent evil intent, a confusion rooted perhaps in Hollywood notions of voodoo. Despite their fearsome appearance, the role of minkisi is mostly a defensive one. Villagers consulted them to obtain protection from illness and other misfortunes, and to swear oaths and forge pacts. 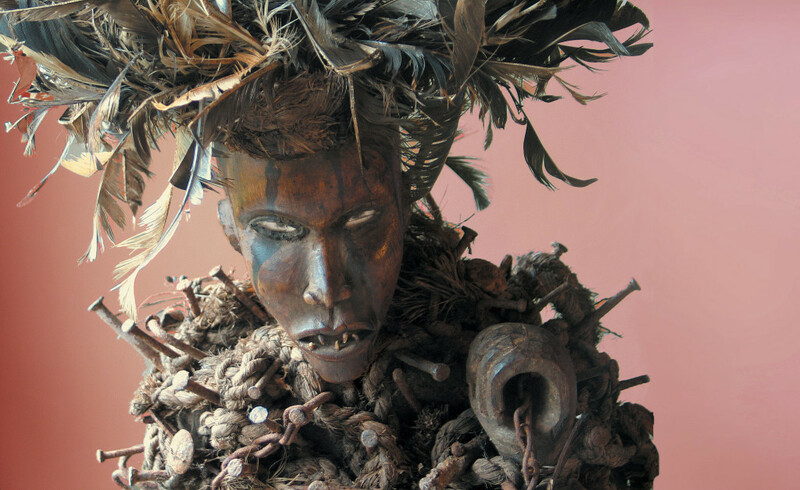 This exhibition’s aim is to introduce unfamiliar cultures and aesthetic values to antipodean audiences. 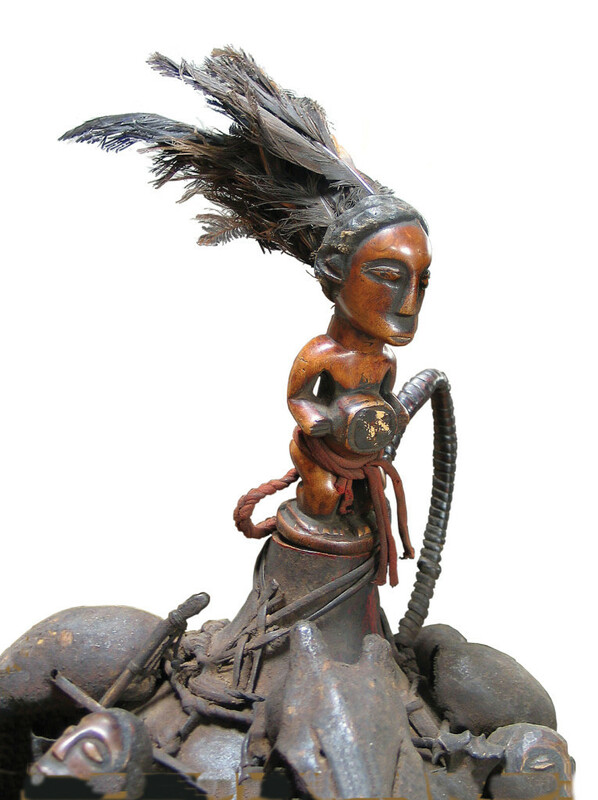 Minkisi works on several levels; while most of us respond to the immediate visual impact of these exotic and powerful objects, a curious visitor is inevitably sensitive to a deeper spiritual dimension. 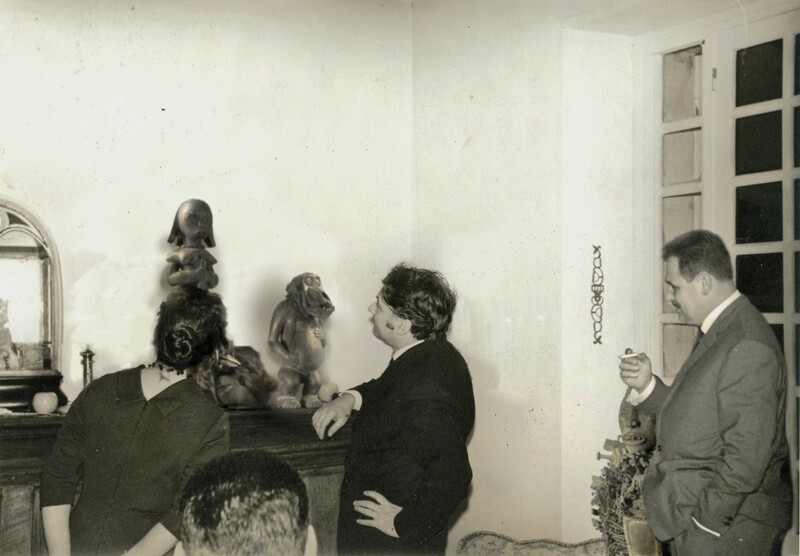 With this in mind, brief texts are provided for each object, enabling greater insight into its function and meaning, referring when necessary to the complex and sophisticated belief systems condescendingly referred to as Animism. Where do these objects come from and how did they get here? 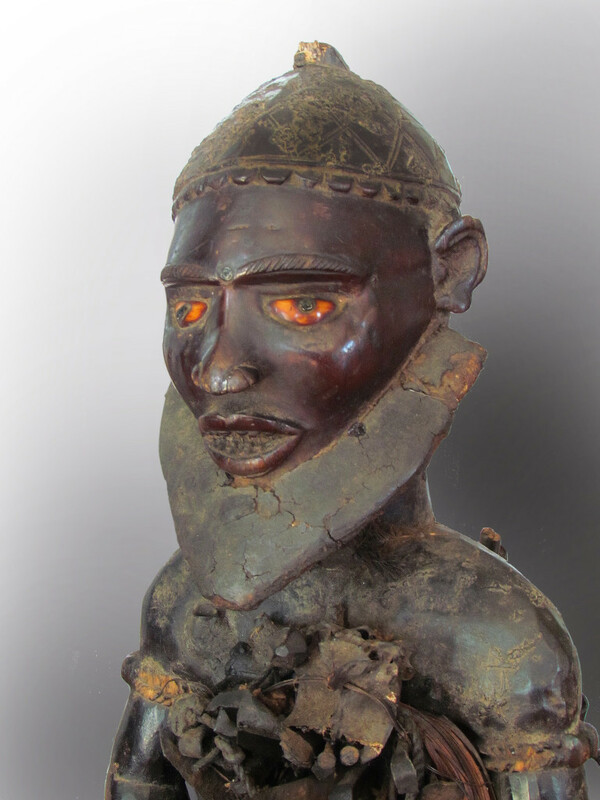 In many African societies a mask or statue can outlive its magic. This is especially true for the baKongo and their minkisi. 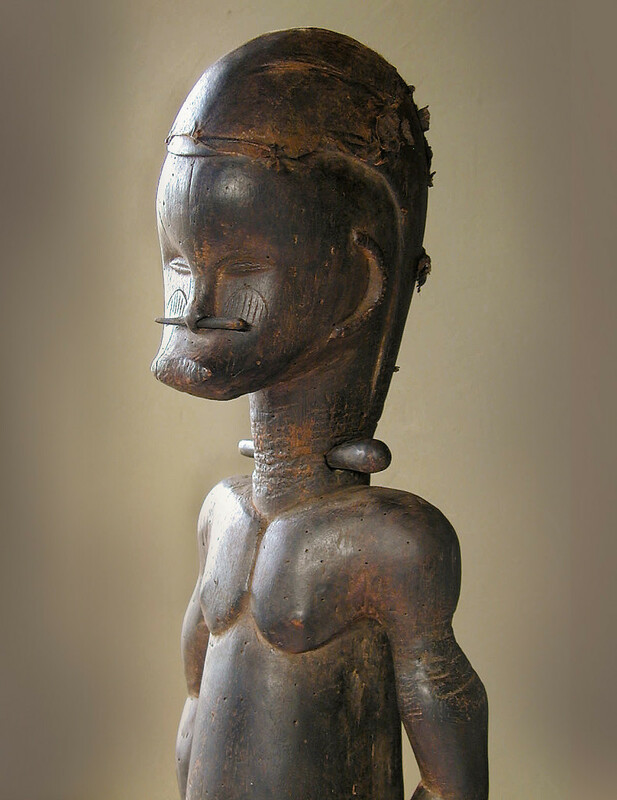 If a statue is considered to have lost its spirit or power, it is abandoned to the weather and termites, or sold. If sold, works that have a religious function are de-consecrated in a ritual performed by a nganga, (priest-diviner-healer). Traces of de-consecration libations are visible on many of the works in this exhibition. 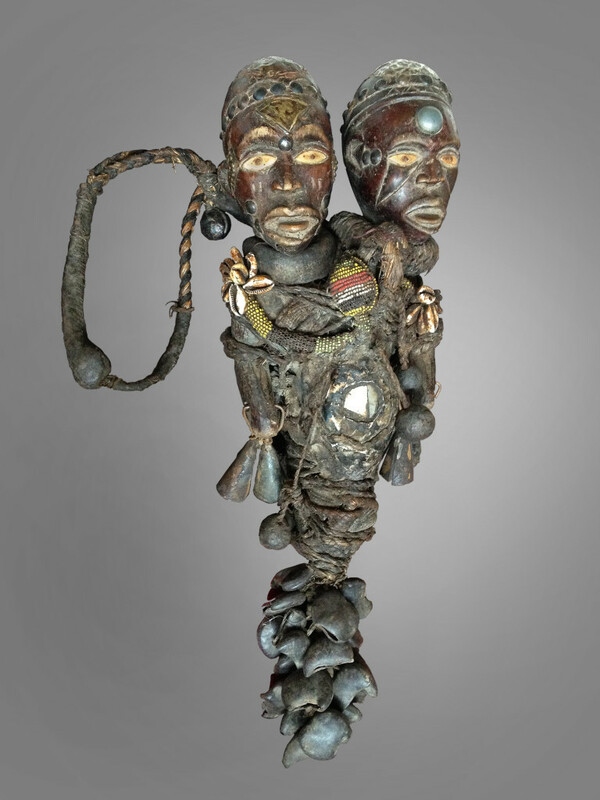 The nucleus of the collection was assembled by Frenchman Paul Le Lay, who from 1946 to 1959 was posted in all of the capitals of French territories in Africa. After Le Lay’s death his collection languished in an attic in Burgundy. Years later it was recovered by his son-in-law, Desmond Bovey, a New Zealander who worked in France as an Art Director and illustrator. During his 30 years in France Bovey’s fascination for these objects grew. In his turn, he made repeated trips to West Africa in a quest to understand the works and the belief systems that produced them. 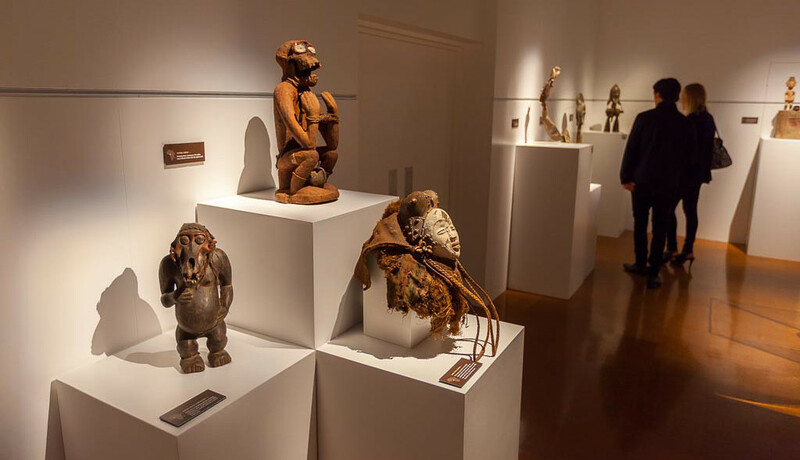 Back in New Zealand, it is Bovey’s wish that these objects, so little understood, and the unknown artists who made them, be accessible to a wider audience. Following its success in Whanganui (extended due to popular demand) Timaru and Nelson, Minkisi is now being made available to galleries throughout New Zealand and Australia. 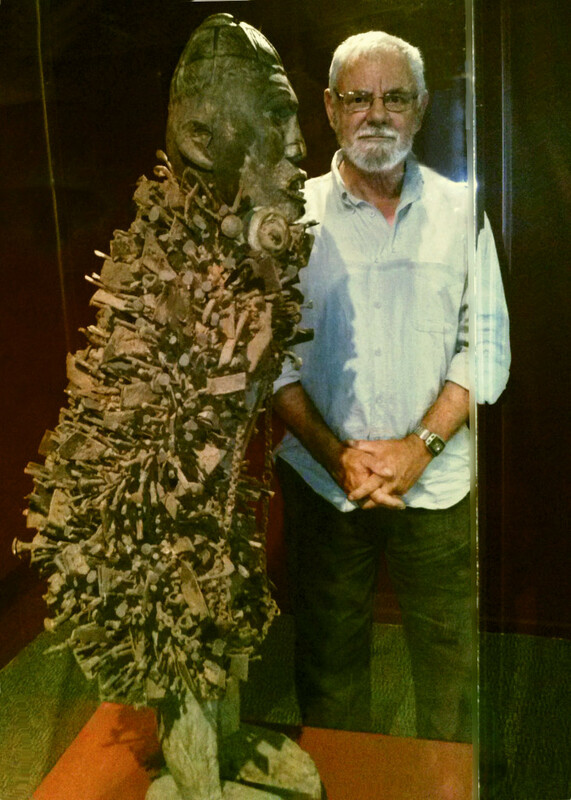 -Desmond Bovey is available for a talk about his voyages to Africa and his quest for understanding of the works in his collection and the belief systems that created them. 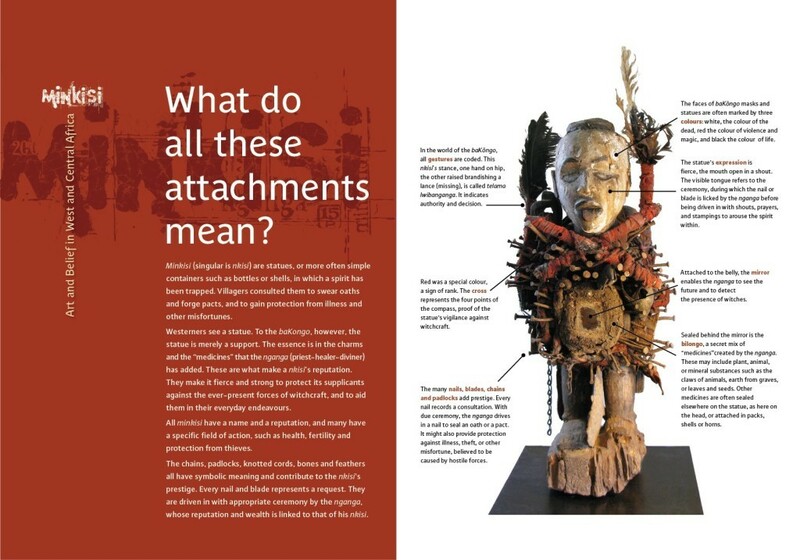 A small but informative catalogue was produced for the Whanganui Regional Museum exhibition, 28 pages with 2 cover flaps, colour-coded to the 3 regions around which the exhibition is organised. Created in InDesign, it could easily be adapted for reprint. This entry was posted in Exhibitons Currently Touring and tagged minkisi on February 6, 2016 by Mark Roach. Seventy-five minkisi statues and masks. Four wall panels addressing frequently asked questions. West Africa; Gabon and southern Cameroon. Short but informative labels exist for every work in the exhibition. An exhibit’s origin is indicated on a map of the continent. Wall & base mounts from Whanganui exhibition. Approx 35-45 plinths – some (5-6) requiring perspex tops. $2,200 +gst, plus onward freight. – Whanganui Museum; Oct 2012 – May 2014. – Aigantighe, Timaru Dec – Feb 2014. – The Suter, Nelson; Feb – April 2014. – Aratoi, Masterton. Sept through Nov ?